Those spending time outdoors can help catch poachers. Whether spending time in the field on a hunt, fishing at a favorite lake or simply recreating outdoors, the eyes and ears of the public can be vital in catching those doing wrong. Acts such as illegally stocking goldfish or poaching a large buck reflect not only on a single individual, but also on the entire hunt-ing/outdoor community and the State of New Mexico. 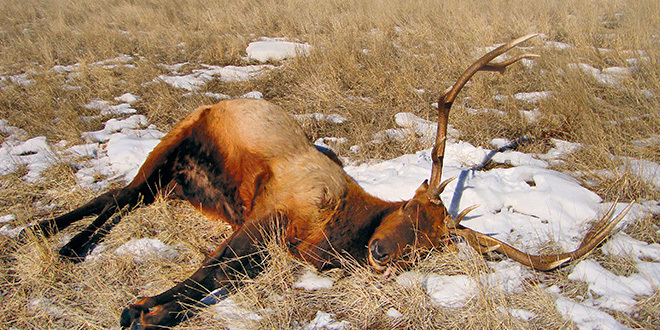 Above: A bull elk killed by a poacher and left in a field to rot. NMDGF photo. In addition to poaching, acts such as the unauthorized stocking of pike in Eagle Nest Lake has cost Game and Fish money that could have been better spent. For those encountering an illegal act, or some-thing they believe might be illegal, there are important “should” and “should not’s” for the public. Following these recommendations will increase the likelihood of an arrest being made and keeping the witness safe. This need to share information means there are those who know a crime has been committed, but there are important guidelines to follow when reporting a violation. Jackson said there are times when those who witness a crime inform the violator they will be calling Operation Game Thief or report a Face-book post. They may also attempt to conduct their own investigation and gather evidence in an attempt to help, but both actions can hinder and complicate an investigation. “In situations like these the poacher will almost always leave the area before law enforcement can arrive, or delete an incriminating post or photo,” Jackson said. “A better approach is to simply be-come a good witness. Take notes and, if possible, photos. Modern poaching is rarely about feeding a family and it should not be confused with hunting. Hunting is a legal activity and poaching is a crime. Wildlife population estimates determine the number of licenses for legal take, which helps manage specific populations. 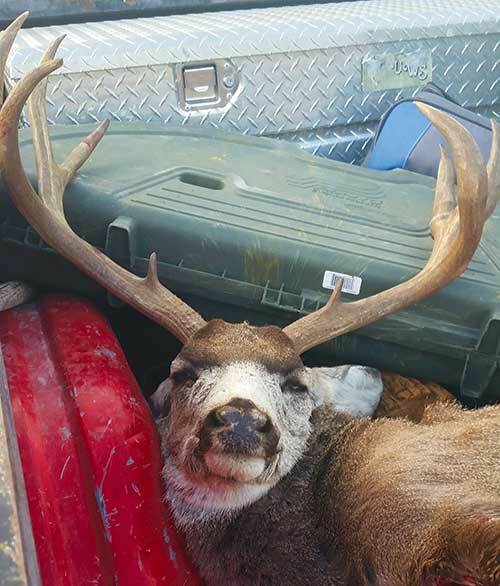 Poachers are stealing from all residents of New Mexico. NMDGF photo. Witnesses should avoid contact if possible and never confront a poacher. Directly confronting suspected violators in the backcountry can be dangerous. Call the OGT hotline or submit a report through the OGT website as soon as possible with the information. Other potential mistakes include getting too close to the scene, examining a dead animal or waiting too long to contact OGT. Evidence that has been disturbed or picked up by a witness can result in a poacher skating on what would have otherwise been an open-and-shut case. Waiting a day or two to report a wildlife violation is also problematic. With time comes the loss of evidence due to scavengers or poor weather conditions, such as heavy rain. 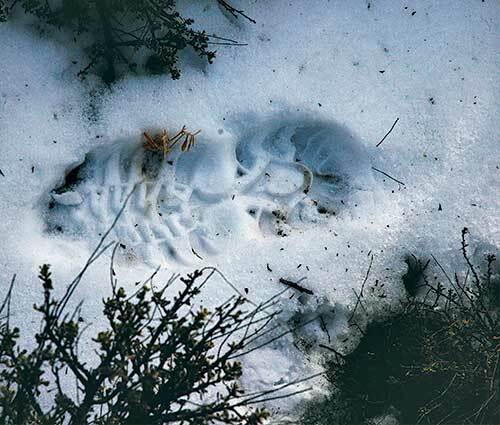 Two rules in helping conservation officers catch poachers is to report suspected illegal activity quickly so evidence is not lost and to leave the scene undisturbed so evidence can be photographed and/or collected. NMDGF photo. And eyewitness accounts are not always necessary to bring a poacher to justice. Overhearing someone brag about a poaching case in a bar or restaurant, or a posting and photos on social media can certainly help. Those wishing to report a violation are encouraged to contact OGT because they can remain anonymous, which can’t be guaranteed to individuals contacting one of the Game and Fish offices. Anyone witnessing or suspecting a violation should contact the OGT 24-hour toll-free hotline, (800) 432-GAME (4263). Web submissions can be submitted by visiting wildlife.state.nm.us/ogt. Rewards are available for information leading to charges being filed.